The Saitek Master Chess Computer is the ultimate challenge in computerized chess play. In the chess computer industry, chess computers are rated according to playing strength on a scale of 1 to 5. 1 being a learning or traning platform suitable for beginners or children. A 5 being a platform designed for the most experienced Chess Master player. The Mephisto Series Kasparov Master Chess Computer is a "level 5 machine". It is the strongest most capable Chess Computer in its price category on the market today! With its 256 play level settings; this computer is ideal for advanced Chess Players. With its unique combination of special coaching features, playing modes and set up options, the Master Chess Computer will offer you all the variety and game play stimulation you’ll need for an ultimate Chess Match. Some of its key features include: 64 Playing Levels: Normal, Tournament, Speed Chess, Infinite, Fun, Problem Solving, and Training. Very strong program Play Rating 2500 at 40 Moves in 2 Hours: again, ideal for advanced players. Info Mode: lets you see inside the computer’s mind. Coach Mode offer blunder and tactical alert warnings. 200-move Take Back: allows in depth post-game analysis. Option to play against the computer or a friend. Set up positions and problems for further study. Provides you with hints and tips to help you improve your game. 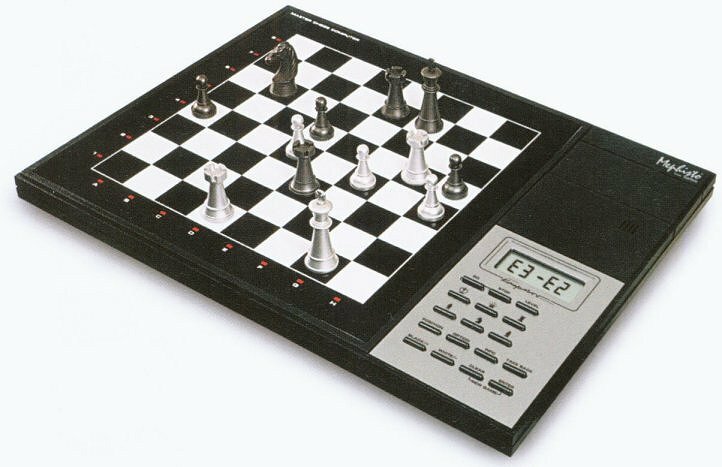 With the mephisto master chess computer, all major openings and many famous Grandmaster moves are at your finger tips. Automatic Power Down feature and Power Management Intelligence conserves battery life. Unfinished games held in memory so you can pick up from where you left off. AC/DC Adapter included along with a Portable Carrying Case.